With both half term and summer just around the corner, kids will be starting to get excited about breaks from school and you might be wondering just what to do for the time off that will be enjoyable and family friendly. While there’s a whole host of things that you can do with kids of all ages during school breaks, it can seem daunting to pick just one or two main ideas to help them enjoy the holidays. Here are a couple of great half term and summer break ideas that kids of all ages will love. 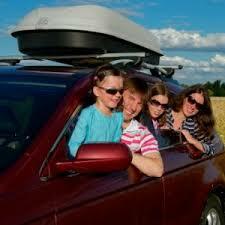 Road trips throughout the UK can be a great way to get out of town for awhile as well as entertain the kids. Whether you go far from home or you just explore the next county over, a road trip is a great way to do something fun with all the family. Road trips can also be as long or as short as you want, meaning they have huge potential to be a family favourite activity and can include almost anywhere and anything you desire. Not only that but there are tons of things you can include such as various Devon tourist attractions or a trip to the Scottish Highlands. Everyone loves camping – or, that is, most people do. Kids love it because it’s something a bit exciting and new and the concept of sleeping in tents for several nights is pretty fantastically novel along with cooking campfire food and all sorts of other fun stuff that includes the great outdoors. Whether it’s swimming, building dens in the forest or hiking, camping has a lot of awesome outdoor activities that you can partake in. For those who are a bit pickier about their sleeping arrangements, consider glamping – a more posh version of camping. If you aren’t sure of what to do for your family getaway, why not consider travelling to visit friends and family, wherever they may be. Whether they’re abroad in a different country or they’re across the UK a couple hours’ drive, visiting friends and family is a great holiday idea and it can help kill two birds with one stone in terms of combining a visit with a holiday. So if you’re trying to decide what to do with your children’s breaks from school coming up soon, consider one of these great ideas. You never know just what fun you can have in free time, so hopefully these ideas will help you make a cool plan.